Hi everybody! Meet Doktor Boris Krackpotnik - Wyrd Beastmaster Druid, and his two pet Maw Beasts. There is no StuntCat - only Zhuul! 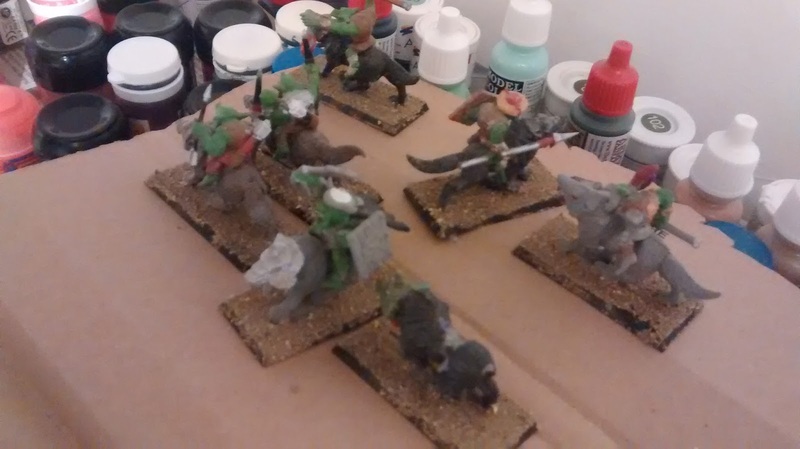 Boris and his mutts are the second entry to my Rogue Quest project. What is Rogue Quest you ask? The idea is to produce a band of 6 Adventurers that match the classic D&D/Warhammer Quest character classes, but for the Rogue Trader universe! 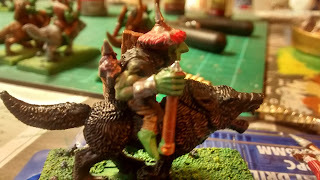 Although the Wyrd Beastmaster is a Necromunda model I felt the low-tech elements of the model fit well with the RT universe, and there was something that really appealed to me about the face in particular. This is not what the model conjured up in my mind! As I sat looking at the model deciding on how I was going to tackle it, two characters were brought to mind. 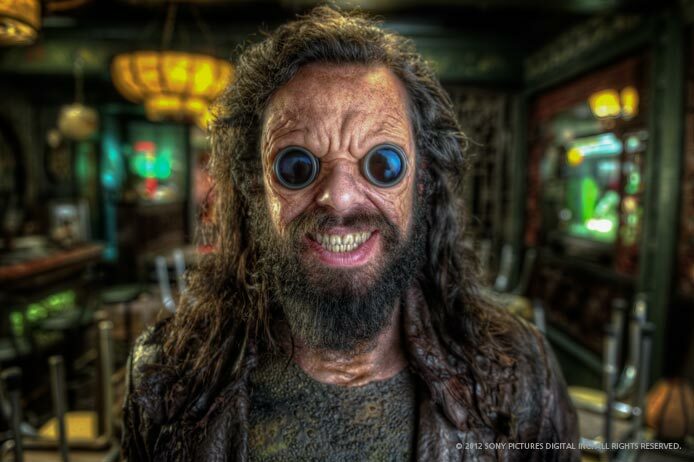 Firstly, Boris the Animal from Men in Black 3. A cracking villain for a family film, with a strong vibe of alien animal life running through him. Yes, Boris would be a good source of inspiration for my Druid, who I definitley didn't see as the benign tree huggng type. Boris the Animal from Men in Black 3 - no spoliers in case you haven't seen it, but don't shake his hand. 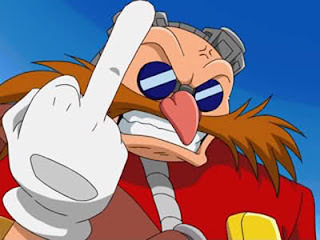 The second figure the model reminded me of was Dr Robotnik from the Sonic the Hedgehog games. It's the hair and glasses again, but also the non-traditional approach to animal welfare that would bring a different slant on the Druid character class. So, with those two sources of inspiration Doktor Boris Krackpotnik was born. One of the big attractions with choosing a Druid, along with it being quite outside the traditional character or troop types seen in RT/WH40K, was the chance to add some alien animal companions to the party. One of the things that really sets Rogue Trader apart from later versions of the game were the alien flora and fauna included in the rules for the enterprising games master to spice up his encounters. 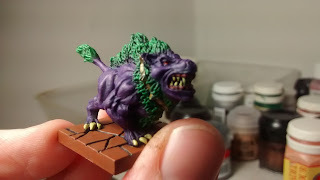 Now I could have sourced myself a Gyrinx, or found something suitable to use as a Catachan Devil, but I stumbled accross some Dungeon Saga Maw Beasts, which seemed to match what I had in mind for Boris. I went for a contrasting Purple/Green colour scheme as the beasts are essentially canine I wanted to emphasise their natures by having an alien colour skin/hair tone. I've probably been too conservative with the purple higlights again though. The plastic was more flexible than I'm used to, though not as wobbly as reaper bones, and the mini was pre attached to the base, a bit fiddly to paint because of those two issues, but once the undercoat was on the paint seemed to behave fairly well. Cracked paving bases were part of the the model. In the end I've just chosen to keep the brown colour to tie them in to the rest of the group, but not try and flock them as that risked loosing detail around the feet. For Boris himself I took the first prompt from the colour scheme I used on Sven Spielboard my Squat Bard, using the sea green and uniform grey on the overalls and webbing, and brown-red ink blend on the skin for that ruddy look. I also knew I was going to be using bright red as the spot colour, so wanted to make sure that would stand out on the final piece. One of the main features with this model is the patchwork animal hide coat, and again I wanted to emphasise some of the alien animals that might be included, so chose a dark red and a vibrant green to pick out those patches made of scales or lizard hide, the rest was kept fairly natural and muted, with plenty of inking to keep it looking dirty and lived in. I reckon Boris sleeps in that coat. The oversized stub gun and shot gun shells provide a nice visual tie in accross the model, the shells in the webbing at the front gave a chance to use the bright red spot coour, as did the empty shells woven into his hair at the back, Edward Teach style. His hair is supposed to be black, with a few grey hairs showing through, but as we all know flat black looks terrible on most finished models, so I went with a very dark blue in the mix and worked up with blue-grey highlights. I'm really happy with the finished effect as it looks dark and oily, but not unnatural. A final flurry of bright red on the sash on his staff and he was ready. Here you can see the ful range of animals that died so that Boris could have such an impressive jacket. If I was a Maw Beast I'd watch out. So just who is Doktor Boris Krackpotnik? Well that remains something of a mystery. Known but also feared in the hunting and farming communities of the small frontier world where he made his home, as a man who could help as easily in the birthing or healing of a beast as he could in it's tracking and killing, he was accepted by the local population even though he was not one of them. His true place of origin remains unknown. Boris made himself invaluable to the team on that mission, proving his worth in combat as well as his extensive knowledge of xenobiology and practical survival skills. More than this, his potentially psychic link to his pet beasts, and with other animals, was not unnoticed by the Unit's tactiturn but enigmatic leader. Boris and his beasts are on the hunt for some elusive alien quarry - stay tuned for Rogue Quest Level 3 to find out what they are hunting! So, thanks for reading and look out for Rogue Quest Level Three coming soon! Hi all! By the skin of my teeth I've made it to the end of my project for the Middlehammer group's Mayday! Mayday! monthly painting them challenge. My Goblin Wolf Riders have been restored from the botched and broken state they were in when I bought them cheap from ebay to a reasonable tabletop standard (which is what I was aiming for with this project). The initial stages of this project can be seen in my previous post. 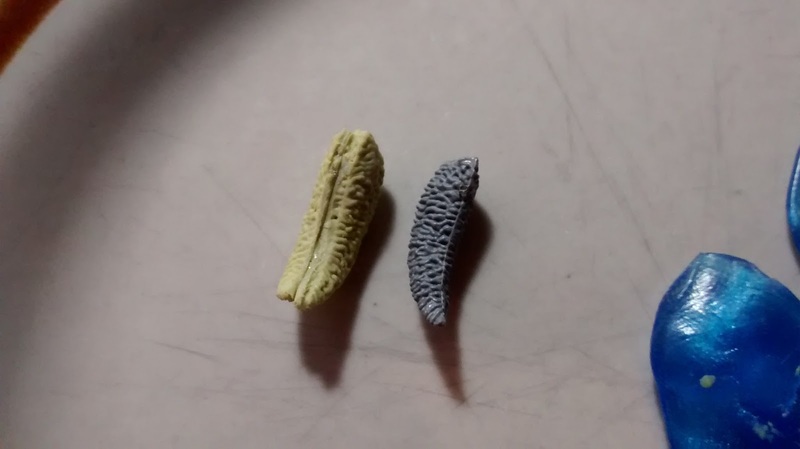 One of the things this project has pushed me to do is try a new modelling technique - press moulding. There were a couple of missing tails and I din't have anything similar in my bits box so press moulding was the obvious answer. I'm using 'blue stuff' from Green Stuff World, and their Youtube channel has some useful tutorials. 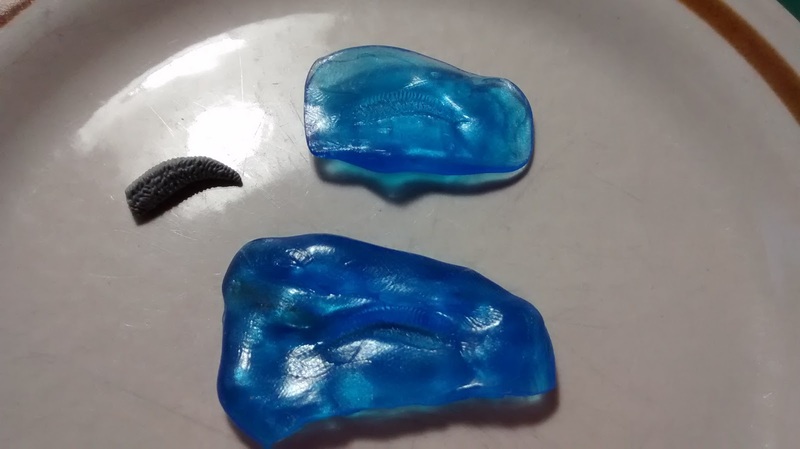 One stick of blue stuff was enough for two small moulds, one for each 'half' of the tail. This was the first attempt. I wasn't confident enough in my trimming and filing - but proof of concept had been achieved! This was the second attempt and much crisper. If I hadn't been workign to a deadline I'd have made a few more and only used the best ones. Another technique this project required was drilling and pinning. I've only done this once before so am very much a novice, but it was clear that a simple glue repair would not last very long on the broken banner pole so I clipped off a tiny bit of paperclip and got to work. I realise now that I should have accepted a slight reduction in height of the banner pole and cut the two ends completely flat. They were slanted in a way that they still fit together pretty wel, so I thought it best to leave them as they were, but trying to drill into and angled service was more trouble than it was worth and I nearly went throug hand out the side of the gobbos hand. Lesson learned for next time. You can just see the tiny nub of metal sticking out of the bottom half of the pole. The join was pretty flush, so despite the near disater with the drilling I was happy with the end result, which didn't require any putty. It turns out there was a missing arm too. A random stump had been included, but on closer inspection this was a right shoulder stump, so initial plans for some form of dubious goblin-made prosthetic using rusty metal work were scrapped. I went back to one of the other models and snipped off an arm to be moulded. This was a very ropey bit of work, with only one half of teh arm press moulded and the other built up with some extra bits of putty once the cast had set. I knew that it was largely going ot be covered by a shield and wouldn't be very vsible once teh model was complete, so speed was the order of the day here, and the final result is passable enough. 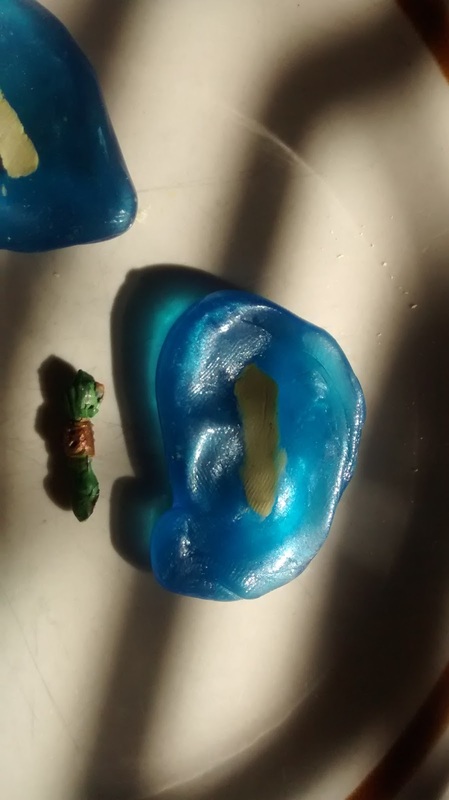 Sorry for the crap photo, this was the only shot I had of the arm being moulded. The whole unit had been initally been constructed in a way that annoyed me. There were 5 archers, which included a musician and bannerbearer, 3 spearmen, two with a shield, one holding a severed head. And two sword armed leader types, both riding armoured wolves. One had a shield and one had the same arm holding a severed head. For me they are neither one complete unit, nor two smaller ones. In the end I have gone for a unit of 5 archers, which includes the standard bearer and musician, and a unit of 5 armed with melee weapons which includes both leader types, but I've added a couple of shields (one of which I press moulded as it was going on the back of the model so didn't have to be perfect, adn I was getting carried awy with the milliput by then - the next scenic base I do is going to be covered in tiny putty mushrooms) from an earlier WFB orc and gobbo set, so at least all 5 have a shield. I also thought that one severed head was enough. Others may disagree. The 5 Archers. No obvious bend in the repaired banner pole so I'm happy enough with that. Only the banner bearer has a replacement tail. You can tell, but not so much that it is a problem. In an aerial shot you can really tell the difference between the earlier moulded tail (far left) and the last version (dead center). Close up of the press moulded shield. a little ropey, but good enough for a first try at shields. 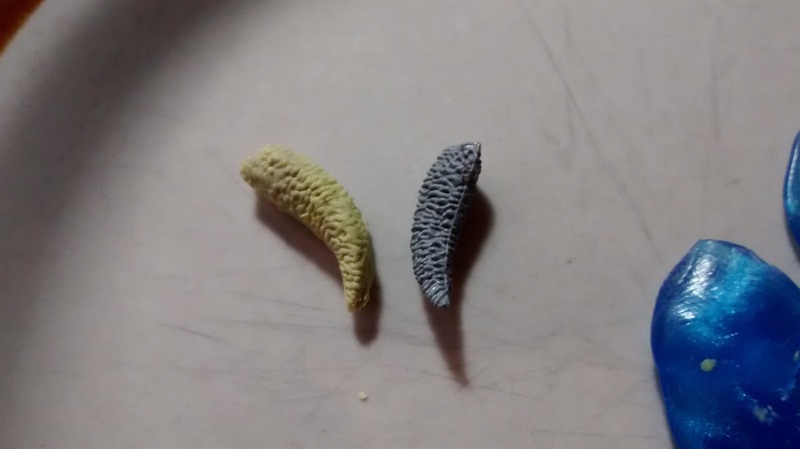 Again, I've really enjoyed the challenge of the monthly painting theme - this one has pushed me to try new techniques that should be the staple fair of any accomplished modeller, so I feel like I've got some important practice in re: press moulding and drilling and pinning. 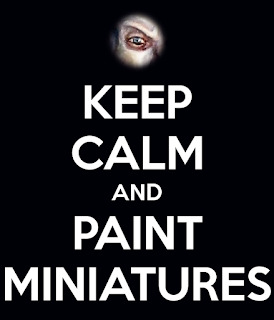 It has been quite time consuming though, I've not really got much else done this month, miniatures wise (although I have been very busy painting and reparing scenery). 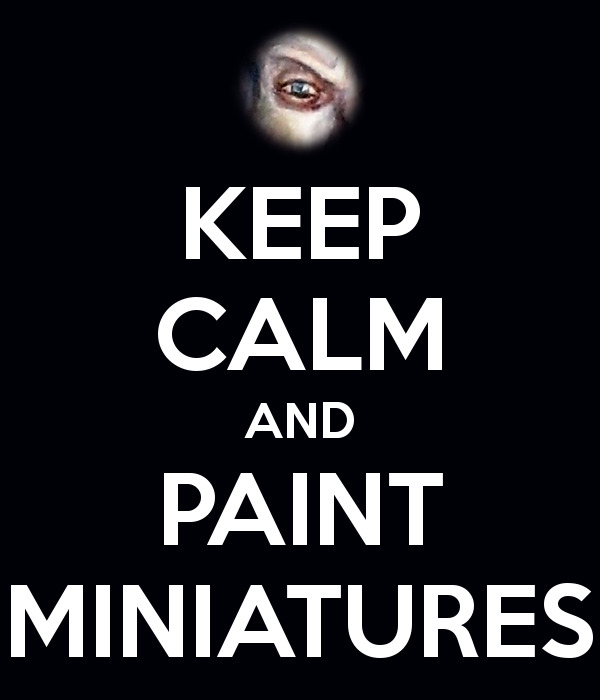 I'm looking forward to the next painting theme. There was a suggestion on the Middlehammer fb page it should be sports themed, given it is a Summer of Sport yet again this year, if that does get chosen then I've already got something in mind, but it will be a lot more straight forward and less time consuming than this bunch! Before you leave, let's take one last look at the whole rabble enjoying a bank holiday ride in the Elven countryside. They've been busy scouting for the Forces of Evil (TM) in our ongoing WHFB4 campaign Crisis in Caledor! Hopefully you'll pop back for the next battle report in the series. Here they are all together, racing down the road looking forward to a trough full of Pedigree Chum. These Gobbos have been scouting the area around this Elven watchtower. Luckily for them the Elves were all watching the tennis and not the road. 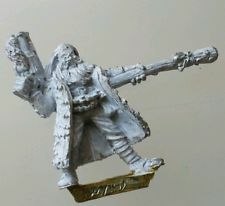 In a perfect follow up to my last entry this post is about the Middlehammer group's monthly painting theme for May 2016, and it is a cracker! The trick with a theme like this is for it to be focussed enough to give it meaning but also broad enough to allow enough people to get involved. Mark Evans has been fiendishly clever in hitting that balance perfectly, whilst combining all the things I love about painting themes (see my last post if you're interested) with this months' theme of Mayday! Mayday! The idea is to rescue a long forgotten (neglected) project or maybe a previous botched paint job - something that is badly in need of some TLC - blow off the dust and cob webs (this can literally be true in the case of some things in my lead pile, I was picking wood lice husks out of a box of random pre-slottas earlier on today... yuck) and get it finished by the end of the month. There have already been some early starters, with Mark himself embarking on a project to finish some Shining Spear Eldar Aspect Warriors, fellow Middlehammerer Grant resurrecting a 15 year old paint job on a fearsome looking Ork Boss, and Craig from Sinders Miniature Painters posting some pics of a beautifuly painted Squat in Exo Armour with aims of completing the rest of the accompanying squad - can't wait for more of those Craig! I'm going to try and rescue some later edition (not sure which?) 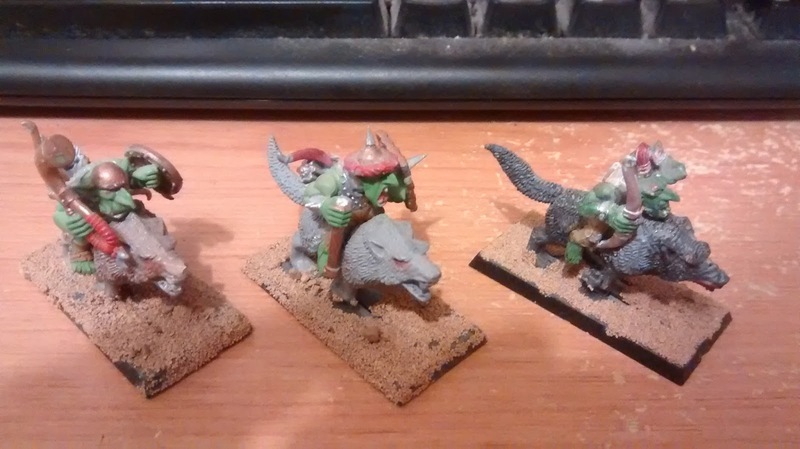 plastic Goblin Wolfriders that I bought as a bit of a junk lot from e-bay ages ago. 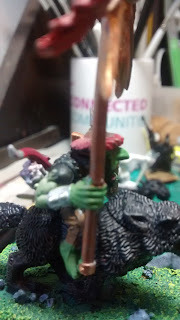 Lots of repairs needed here (broken banner pole, missing tails on a couple of wolves, broken and missing lower arm on one of the goblins etc...) and paint job is more like damage (no undercoat before slapping on paint to thickly in places, and then just brown glaze on naked plastic in other places), but I'm not going to bother stripping them, just try and renovate to basic table top standard. That was always going to be the plan with these. We've already used them in our WHFB4 campaign Crisis in Caledor and they were frankly letting the side down in their current state. 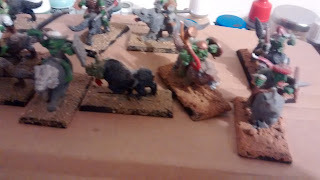 This was in keeping with their disappointing performance on field, being some of the only casualties in the greenskins near total victory in Battle #2. So, they need to be given a bit of a make over to restore their morale apart from anything else. The first task is to try and match the basing material that has been applied to three of the ten models, so I've been out in the garage to start that off. No time to waste! Luckily I had done exactly all of those things earlier today, so I had plenty of sand available to try and match the basing material for the other seven. And in a really blurry mobile phone picture you can only just about really obviously still tell the difference... never mind. I'll slap some green paint on and that should hide a multitude of sins.